Riders who are looking for a longboard that provides them with stability, a smooth ride and ability to turn on a dime should look no further than the Sector 9 Aperture. At 36 inches in length and 9 inches wide at its thickest point, this 7 ply maple longboard is the standard-bearer for longboards. Riders who are looking to take advantage of some of the larger hills in their area will be impressed by how stable the sector 9 Aperture keeps them. It’s Gullwing Sidewinder trucks and its double kingpin gives the board unparalleled maneuverability, allowing riders to make some impressive turns and slides. 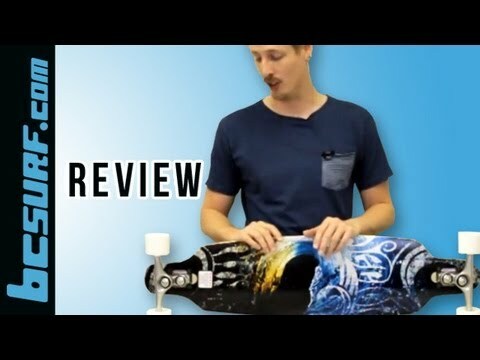 This board is extremely responsive and will react to the slightest movement created by the rider. This board is unbelievably perfect for carving. This board is impressively equipped with 69 millimeter 78a Nineball Slalom wheels and ABEC 5 PDP bearings. The softer wheels will grip the ground, and the high quality bearings work to provide a smooth ride that makes the board easy to propel. The board itself is beautifully designed, and it is aerodynamically designed, which only adds to its speed. Oh, and did we mention that it is phenomenally fast? Anyone who is looking for an attractive, speedy longboard that will make long distance travel a breeze, cruising through a college campus enjoyable and swerving through downtown pedestrians a piece of cake would do well to look at the Sector 9 Aperture.